“There’s a Christ on the Stanniks’ boathouse,” Miles said at lunch, one fine mid-October Saturday. Helena Puumala’s short story “The Boathouse Christ” centers around the appearance of an eerie likeness of a crucified Christ, on the side of a boathouse located in a lakeside community. In the story it becomes clear that something truly mysterious is going on, but as we know, that’s not usually the case. Most of have come across the phenomenon of eerie facial likeness in our daily lives. In fact, it is a common enough that it has a name - pareidolia (I am indebted to astrophysics PhD student, soon to be PhD, Scott Olausen, for pointing this out). The term apophenia refers to the process whereby a fairly random stimulus is perceived as being significant, and facial pareidolia is a specific variant of that. The human mind is wonderful at recognizing patterns in data, even when they aren’t really there. It is especially good at recognizing faces or things that might be construed as faces, which is very useful trait for a highly social animal like a human being. Apparently, this happens very quickly, at a subconscious level, before it rises to the level of conscious thought. Neurological studies indicate that we seem to have a lot of neurons that are devoted to this task – we are hard wired for it. It is theorized that this trait should have a great deal of survival value, so evolution has selected for it. Not only do we quickly recognize faces, but we also quickly attach an emotional value to the face - whether it is happy or sad, angry of indifferent, potential mate or helper or potential rival or foe. It turns out that computer programs designed to recognize faces also make false positive identifications, seeing “faces” in collections of shapes that only superficially resemble faces. For example there might be two circles over another circle and a line, which the computer program “sees” as eyes, nose and mouth, so it calls it a face. I suppose that’s to be expected, as computer programs are ultimately creations of human minds, so it is not surprising that they might share our biases. Below is an image of George Washington that I came across the other day, on my walk to work. It was on the back of a “house for sale” sign and it immediately caught my eye. Perhaps I was primed a bit, by the famous image of George Washington sculpted into Mount Rushmore, which I have included for comparison. I should note that the Mount Rushmore picture is actually one I took myself a few years ago, during a visit to South Dakota, U.S.A.. I would encourage any reader to take a trip there someday - it is quite an achievement (tastefully done) and the surrounding area of the Black Hills and Badlands National Park are pretty amazing too. 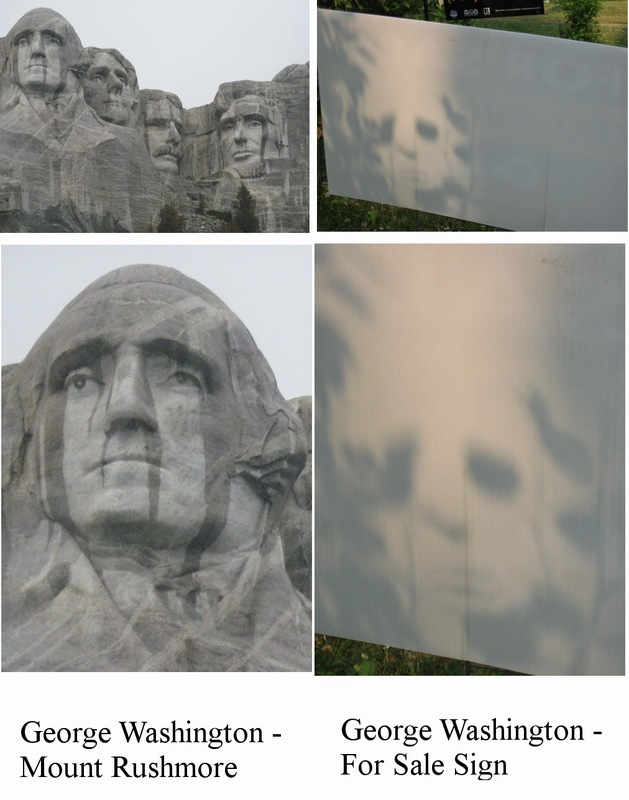 In the case of the miraculous appearance of George Washington on the back of a House For Sale sign, it was a matter of the morning sun casting shadows of nearby leaves on bushes in just the right way to be reminiscent of George Washington, especially for someone who is very familiar with the Mount Rushmore icon, as I am. In this case it was easy for me to establish that the image was merely a trick of the light, by interposing my body between the sun (low on the eastern horizon) and the sign. The image went away immediately. You can also read George’s state of mind quite easily – I think I can, anyway. The House For Sale sign George Washington appears to be rather sad, in my opinion. Even Mount Rushmore George seems a bit sad. I guess being the father of a country is no laughing matter. There have, of course, been many reports of religious iconography being produced in similar matters. 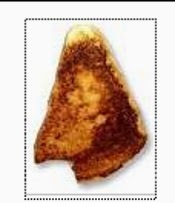 There was the famous case of the Virgin Mary on a grilled cheese sandwich, for example, shown below. Eventually, that fetched 28 grand on eBay for the owner, when it was purchased by an internet casino. God really does work in mysterious ways. I can’t say I get it - the picture looks more like a silent film star to me. Another famous case, and one that has a connection to space science and science fiction is the so-called face on Mars. That’s a formation in the Cydonia region of Mars that has a remarkable resemblance to a face, at least when the light hits it from certain angles, as in the Viking probe picture below. The effect is far less convincing in the Mars Global Surveyor picture, also shown below, though some still see enough evidence of geometrical symmetry to insist that it must be the work of intelligent agents. Proponents of the theory that it is not a natural tend to link it with ancient Egyptian wonders such as the Sphinx, which is undeniably not a natural phenomenon. The case is also made that there are a lot of mathematical relationships within the face and environs, and that these cannot merely be coincidences. Arguments like that tend to run up against problems related to statistical theory, mainly how to interpret results when one makes many post-hoc a-theoretical multiple comparisons. Essentially, when you are analyzing data after the fact, and have a lot of data to sift through, you can find many spurious correlations, even in a randomly generated dataset. So, one has to be very careful when judging these claims. Ultimately, everyone will have to make up their own minds about the Mars feature, at least until NASA or some other space agency sends a probe to the area. The more I look at the Mars Global Surveyor picture, the more it starts looking like a face. But since I can’t stand in front of it, like I could with George Washington on a House for Sale sign, it may just be pareidolia after all.